I designed and 3-D printed a test stand for 9 servos. 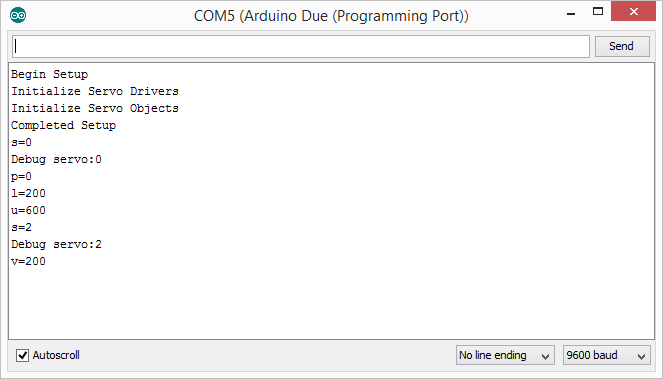 Currently in the works is binary communication with the Arduino to efficiently give servo commands. Once that is complete, I'll begin thorough testing to decide which servo is best for my application. 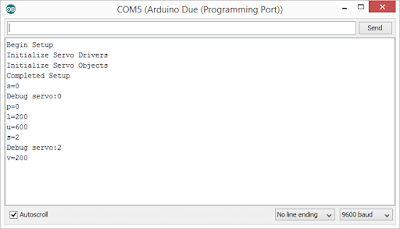 Using the Serial Monitor in the Arduino IDE was convenient for quick testing, but ultimately I want a custom application to control all my servos. So my next step was to recreate the Serial Monitor as my own application (that I could eventually expand upon). 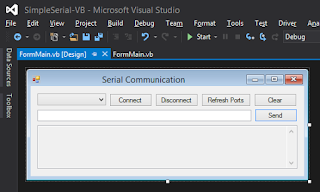 - The program automatically connects to the first COM port it finds. That's generally pretty safe as nowadays the average computer user doesn't have any devices that communicate over a serial port. (Ahh, I remember back in the day, before USB, when you plugged the mouse into a COM port. Or Doom over serial, good times.) This automatic connection is dangerous if you do have devices such as 3-D printers that communicate over a COM port. - The baud rate and similar are hard coded to match my Arduino code, but you may want to expose that as a configurable item. The first dropdown list is for the COM port (automatically selected to the first found at startup). It is named ddlCOMPort. The buttons from left to right are: btnConnect, btnDisconnect, btnRefreshPorts, btnClear, and btnSend. The input text box is txtSend, and the output read-only text box is txtReceive. Ultimately I want a very efficient method for the computer to control the servos, but in the short term I just need a simple way to send servo commands from the computer. 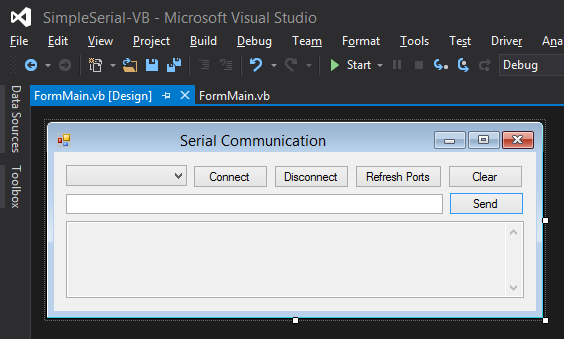 The quickest way to start is to use the Serial Monitor window in the Arduino IDE! First I define a new global variable so I can keep track of which servo I'm controlling. Within the main program loop I continuously check if characters were received over the serial line. If an input was found (.available() > 0), then I call readSerialInput() to check for a command. The readSerialInput() function parses the string that was submitted over the serial line and controls the servos based on those commands. Using the Serial Monitor I can give commands to my microcontroller. This approach is very straightforward to use for a person entering commands on the fly. However, I'll more than likely send binary values when I create the full-fledged servo software. It will no longer be human readable, but it will be faster. Soldering up the servo shield and running Adafruit's examples applications were very straightforward. I recommend following Adafruit's fantastic tutorials to work through that. https://learn.adafruit.com/adafruit-16-channel-pwm-slash-servo-shield/overview However, to manage many servos at once I needed an object model to cleanly handle them all. I want to be able to support not only many servos but many servos on multiple servo drivers. I created a new ServoModel class that contains the index of the servo, a pointer to the servo driver, and the minimum and maximum pulse values. A constructor defines all of those basic values, but there are additional functions to redefine min/max values (configuring for example) and setting the position based on a specific pulse or just a percentage. // Initialize with a min and max pulse length of 200 and 550 respectively. // This value varies by servo! Do not exceeds the physical limits of your servo! // Not good, we're out of drivers for how many servos specified! The code above is the foundation for how the microcontroller will interact with the servos. 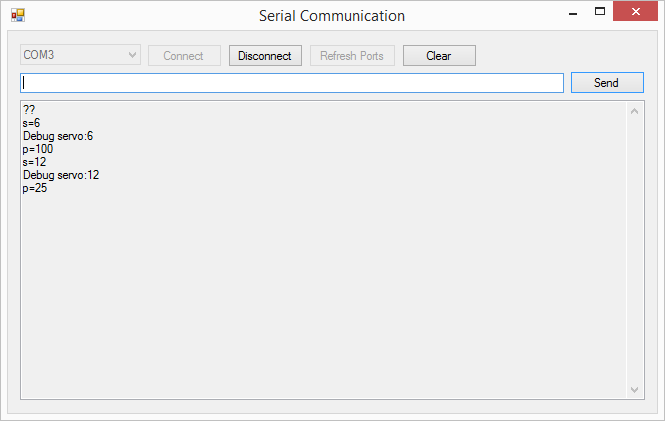 My next post will show how I'm reading inputs from the serial port to manipulate the values of the servo objects. As my Arduino Retro Computer has come to a good closing (well, pausing) point, I'm starting a new long term project. I have some big goals in store, but I'm going to keep the exact plans publicly a little vague as I work through to the final product. Without giving out too many details, I'd like to create a system that enables very quick and simple servo control by a computer program. There are additional input and output features that will be added, but at the heart of it is a robust servo control mechanism. My previous projects have been with Arduino Megas, but this time I'm basing the device around the Arduino Due. It has some impressive stats over the Mega (let alone the Uno). SRAM: Uno 2 kB, Mega 8 kB, Due 96 kB. Flash: Uno 32 kB, Mega 256 kB, Due 512 kB. Plus the Due has loads of Digital I/O, PWM, Analog, and Serial pins. I've also begun testing quite a few servos to try and find the best balance of cost, compatibility, and performance. There are a lot of factors going into which servo to use so that will be in a post all its own.